34 The com. on program report for the next week was read. Adjourned to meet in two weeks with Mrs. Lagrauge. Mrs. R. M. Jackson Pres. Mrs. Gec. Cook Sec. 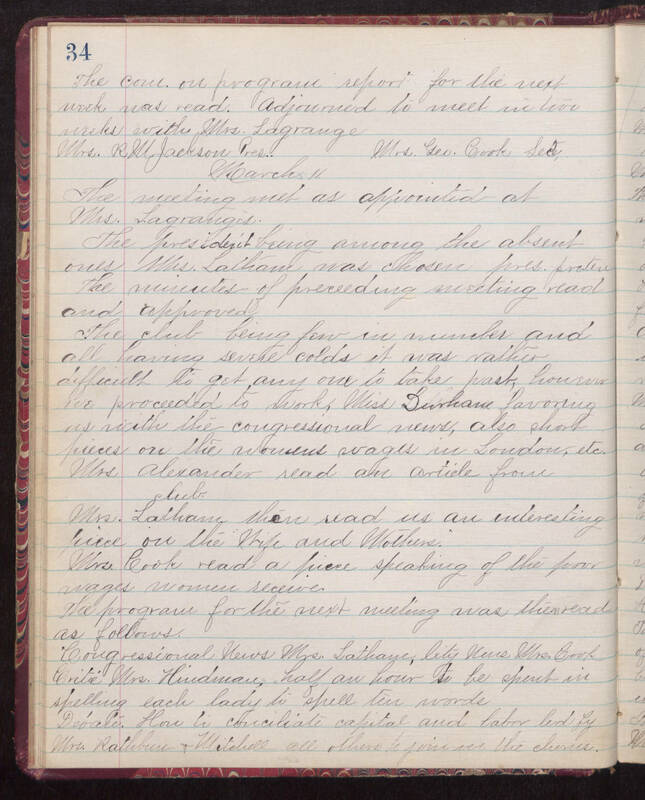 March 11 The meeting met as appointed at Mrs. Lagrauge's. The president being among the absent ones Mrs. Latham was chosen pres. protem The minutes of preceeding meeting read and approved. The club being few in number and all having severe colds it was rather difficult to get any one to take part, however we proceeded to work. Miss Durham favoring us with the congressional news, also short pieces on the womens wages in London, etc. Mrs. Alexander read an article from club. Mrs. Latham then read us an interesting piece on the "Wife and Mothers" Mrs. Cook read a piece speaking of the poor wages women receive. The program for the next meeting was then read as follows. Congressional News Mrs. Latham, City News Mrs. Cook Critic Mrs. Hindman, half an hour to be spent in spelling each lady to spell ten words. Debate. How to conciliate capital and labor led by Mrs. Rathbun & Mitchell all others to join on the chorus.